Surprise your favorite biker with one of these small motorcycle patches. High quality and unique, perfect stocking stuffers or Secret Santa gifts. All under $10! Here's a great selection of small biker patches that will fit in a Christmas stocking. Your favorite biker will love getting a motorcycle patch that fits their personality. Yes, there are some for women too. There are patriotic biker patches, skulls with attitude and and even pretty biker patches. All of the patches are very high quality embroidery and can be sewn or ironed on hats, vests, and jackets. 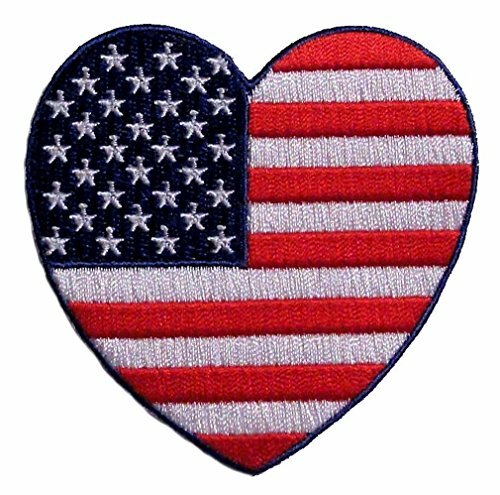 This collection starts with a heart-shaped American flag biker patch. What better way to show how much a person loves the USA. 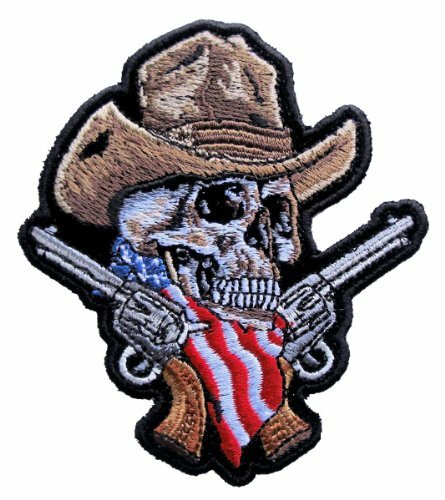 Cowboy bikers will love the cowboy skull biker patch with an American Flag bandana and two guns. If you've got a mom or aunt who loves to ride a bike, she'll adore the multi-colored butterfly biker patch. 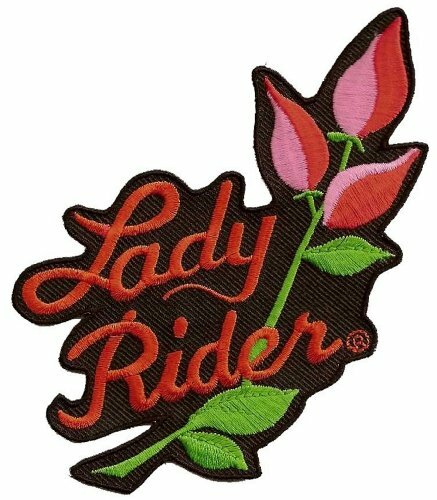 Lady Bikers will appreciate the rose biker patch with "Lady Biker" embroidered on it. This small biker patch collection ends with another patriotic biker patch. This time it's a red, white and blue eagle patch. Bikers are a patriotic bunch. This small heart-shaped flag measures 3 inches wide by 3 inches tall. The top left-hand corner is a blue field with white stars. The remainder of the biker patch is red and white stripes. Just the right size for the side of a denim or leather jacket. Black embroidery defines the edge. Colorful and patriotic. Tuck this in a Christmas stocking. If you aren't going to see the person, you can even send it in a Christmas card. This skull biker patch covers so many interests that it would be a great Christmas stocking stuffer for lots of people. Anyone who loves skulls would be thrilled to get it. The cowboy hat would make any westerner smile. The American flag bandana gives it a patriotic flair, while the 2 six-shooters appeal to marksmen and Second Amendment supporters. It measures 3 inches wide and 3.5 inches tall. This gorgeous biker patch is well under $10 and would fit the bill for any Secret Santa exchange or family gift swap. The butterfly begins with a purple center, then moves on to blue, green, yellow, orange and red. The the white background makes all of the colors pop and the black edge defines it. It is shaped like a butterfly and would look great anywhere on a hat, vest, or jacket. It can be ironed or sewed on. 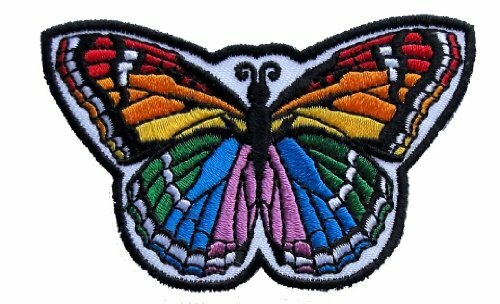 This small butterfly biker patch is 3 inches wide and 2 inches tall. A red rose and phrase Lady Biker make this a good choice for a stocking stuffer for the woman biker in your life. It's feminine but bold. Just like a lot of women who ride motorcycles. The rose that's red with deep pink has a long stem and three leaves. The phrase Lady Biker sits in the lower left-hand corner near the stem. The small biker patch has a nice shape to it. It measures 3.5 inches wide and 5 inches tall. While it's a little bigger than some of the patches shown here, the arching stem provides a nice shape. Very classy eagle biker patch. The red, white and blue flag pattern really compliments the shape of the American bald eagle. His torso is red and white stripes, while his wings have several patterns. They begin as a field of white stars on blue background, then there is a row of red and white stripes and a row of blue and white stripes completes the wing. The beak and talons are red and the tail feathers are blue and white horizontal stripes. The entire biker patch is shaped like an eagle and is edged in black. This patriotic eagle design measures 4 inches wide and only 1.75 inches tall. It can be put on a hat, jacket or vest. 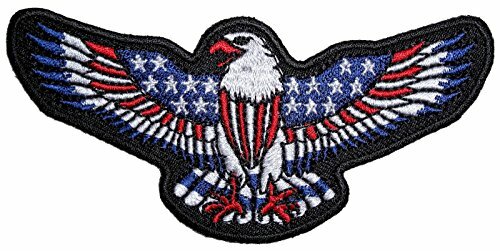 Spread your wings and show your claws with these awesome American eagle motorcycle patches. Patriotic, fierce and very affordable.